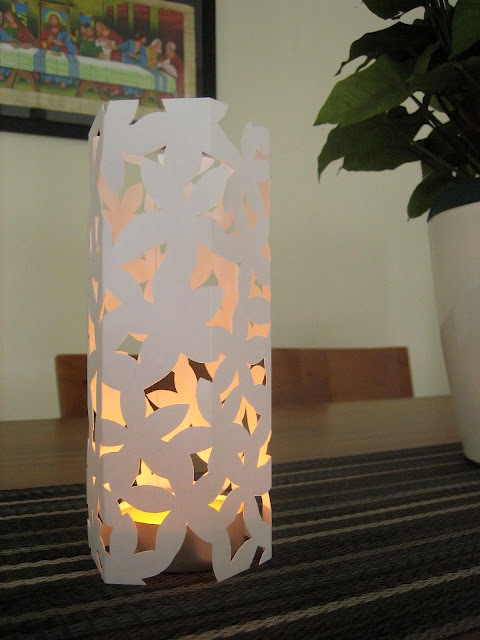 As I recall, one of the very first few papercutting items I did was a candle cover that was referred to as "hurricane cover" that I saw on Patricia Zapata's blog. I still have not that much of clear idea on why it's called hurricane cover. When I hear those words i try to imagine that one piece of card trying to cover the candle fire from a raging hurricane-like wind. It's so weird. I made two of those black paper hurricane cover and they've been sitting on the tv console for about 8 months, and 2 months on the dining table. They caught a number of curious pair of eyes of our home visitors and I happily shared to them about this form of very simple papercutting. A Sunday school teacher even got the idea of teaching the older kids to make some. Anywho, there's this new tealight candle cover now sitting on the dining table (the 2 black ones are now retired). The flower pattern gives such a fresh look from the old triangular ones. This was actually meant for some other now-I-realize-too-ambitious project. It was supposed to be way bigger, involved some wirings and metal frames. I still haven't thought that much about how to work that project, but hell, I came up with this pretty candle cover, so it's not a total loss. In fact, I love its look and am thinking I should make another one so there'll be a pair again.